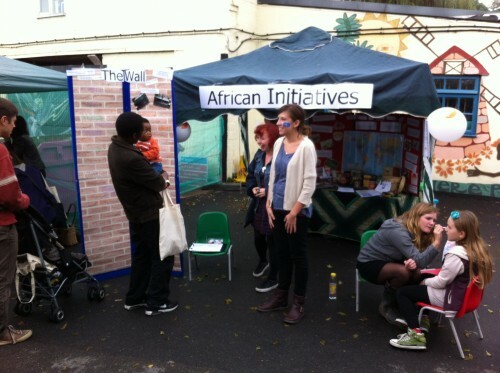 Our ‘Another Brick in the Wall’ project is touring local events and festivals, raising awareness about key issues in global education through fun, innovative and quirky displays and activities. We hope that citizens of Bristol who come and visit our stall will gain renewed perceptions of their local community, learn about diversity, sustainability and many other issues – and above all how they can make positive changes in their lives and, in turn, the global community. Volunteers chat with members of the public at Windmill Hill City Farm’s recent ‘Love Life Day’. The project is well underway and we have already taken our global education stall to three events: ‘Love Life Day’, ‘Make Sunday Special’, and ‘Afrifest’. ‘Love Life Day’ was an event held at Windmill Hill City Farm to promote sustainability and healthy living to local families. Our stall gave visitors information on where their food comes from. Using a world map, people could match up their favourite foods with a country and learn about food production and trade. People were encouraged to shop more locally, or even grow their own veg. On the side, our fabulous volunteers were also painting flags on children’s faces, of the various different nationalities that Bristol encompasses. Back in September, the first training session was really good fun. Amongst scoffing cake and drinking lots of tea, all volunteers had the opportunity to try out various activities before deciding which ones to choose for their chosen event. 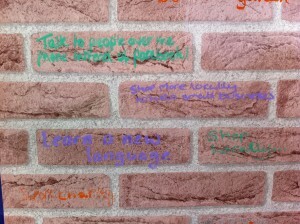 Some of the messages people have written onto our ‘Travelling Wall’ of small steps they plan to take to improve the local area. It’s not too late if you would like to get involved and benefit your local community. Alternatively if you know of an appropriate event coming up that you think we could come along to, please let me know!